I learned how to make a banana pie recipe because I love banana pudding. My favorite banana pie is like the pudding but is held in a flaky pie shell. The banana took the United States by a “storm” in the late nineteenth century. This is about the time when so many bananas started being imported. Since this was not a fruit which grew here we had to count on the markets importing them from other countries. When I was a child, bananas were so expensive that we rarely had them in our home. Other families also found them too expensive to purchase on a regular basis. For us, it was only for special events like our family reunion. Eventually, grocers found they would end up with an abundant of overripe bananas. This problem in the grocery stores with the bananas led many cooks to learn how to make a banana pie recipe as well as other dishes. We began to see overripe bananas being sold in large bags filled to the top. This is when Dad would start purchasing this fruit. Dad said they even taste better at this ripeness. I think the price really had everything to do with it! Whatever the reason behind it, we could now get lots of bananas. Bananas to eat and for learning how to make all kinds of recipes. Actually, Dad was right. These extra ripe bananas are the best for making pudding, pies and all kinds of recipes. Dad would make his “now famous” fresh fruit salad. We all agreed that for recipes like this we prefer ripe bananas but not as ripe as I like for puddings and for baking. 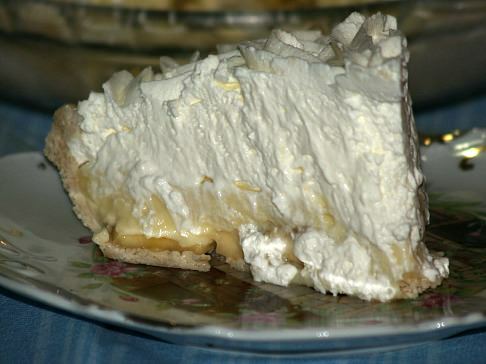 I worked hard learning how to make a banana pie recipe with a thick creamy custard filling. I tried adding the bananas blended into the filling. I tried recipes with banana slices layered on the crust. Both ways can be good but I prefer blending in the bananas. The bananas blended into the custard make that great banana flavor come alive. The type of crust used is really a matter of personal taste. I like to try different types. Most of the type I simply use a single crust basic pastry dough. Graham cracker crusts also are very good with bananas as is a chocolate or vanilla cookie crust. Bananas and chocolate makes a yummy combination! The topping is another choice for you to make. Many people think whipped cream and meringue topping are one in the same. Not so! Some choose to add a dollop of whipped cream on top of each piece as it is served. You can also spread whipped cream all over the top so when you cut the pie it is already on. I prefer egg white meringue topping now since I am older. These are all up to your personal taste. All ways are tasty! Instead of making a cream filling, you might choose to add bananas to other fruits. These pies are also great tasting! Because banana pies are so popular, I have also included a recipe for a diabetic pie for those who are on sugar free diets. This banana pie recipe can be topped with meringue or whipped cream. Combine sugar, flour and salt in top of a double boiler. Add milk slowly while mixing thoroughly. Cook over rapidly boiling water stirring until thickened. Cook 10 minutes longer stirring occasionally. Stir small amount of hot mixture into egg yolks; pour back into hot mixture while beating vigorously. Cook another minute; remove from heat and stir in butter and vanilla. Set mixture off to cool; peel bananas and slice into pie shell. Pour cooled filling over top of the sliced bananas. Top with sweetened whipped cream if desired or egg white meringue. FOR MERINGUE TOPPING whip 3 egg whites until stiff but not dry. Add 5 tablespoons of sugar, 1 at a time, beating thoroughly after each addition to dissolve the sugar. Spread meringue over the top bringing it out to the edges to prevent shrinking. Bake in preheated oven at 350F degrees until meringue is lightly browned. Combine whipping cream and half and half in a large mixing bowl; add pudding mix. On low speed blend milk mixture; add ice and blend 5 minutes. Increase speed to medium and beat another 5 minutes. Increase speed to high and beat until pudding mixture is very stiff. Line cooled pie shell with one sliced banana. Fill pie shell with 1/3 of banana pudding mixture; slice another banana over the top of pudding. Add another layer of pudding mixture (another 1/3 of mixture) and smooth top; slice another banana over the top. Combine the pumpkin, bananas, eggs, sugar, butter, cream, cinnamon, clove, nutmeg, salt, rum and vanilla in a large mixing bowl. Beat until well blended scraping down the sides of the bowl. Bake about 1 hour or until a sharp knife inserted in middle comes out clean. Let cool until just warm and serve with whipped topping. Combine milk and vanilla in a medium saucepan; cook over medium heat until warm. Combine egg yolks, sugar and cornstarch; gradually stir in about a fourth of the warm mixture while stirring. Return yolk mixture back to saucepan and cook stirring constantly about three minutes until mixture bubbles and thickens. Add butter and grated white chocolate; stir until smooth and butter and chocolate have melted. Gently stir in liqueurs; cover and chill thoroughly. Toss banana slices in lemon juice; gently fold bananas and whipped cream into chilled custard; spoon mixture into baked pie shell. Add white chocolate curls to top of pie; cover and chill about 2 hours. Combine pudding mix with milk and cook as package directs; remove from heat. Stir peanut butter into hot pudding; let stand 5 minutes and stir occasionally. Slice bananas in bottom of graham cracker crust and fill with pudding. Cover with plastic and refrigerate until cold. 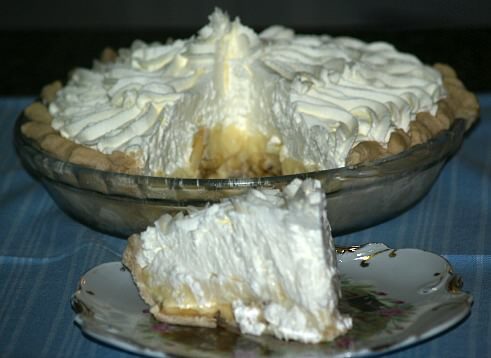 This is a diabetic pie for those of you who love a banana pie recipe but cannot have sugar. Crumble bread in blender; blend until crumbly. Press crumbs in a greased small pie plate with fingers to form even crust; bake 10 minutes at 350F degrees. Combine gelatin, sweetener and salt in saucepan. Beat egg yolks and add to milk; slowly add yolks mixture to gelatin mixture in saucepan. Cook over low heat stirring constantly until gelatin is dissolved and mixture is slightly thickened (20 to 25 minutes). Remove from heat and stir in vanilla and butter flavor; refrigerate one hour or until mixture is thickened. Slice bananas into pudding and pour into baked crust. Beat egg whites until frothy; add sweetener and salt and beat on high speed until stiff peaks form. Spoon whites on pie; place pie about 4 inches away from broiler heat for 30 seconds.